UT MD Anderson Supportive and Palliative Care Handbook, 5th edition. A practical bedside book to assist clinicians in the daily care of their patients. 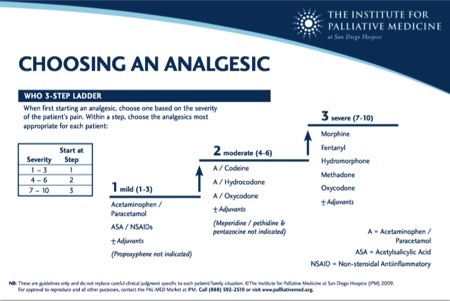 One of several Palliative Care Reference Cards. 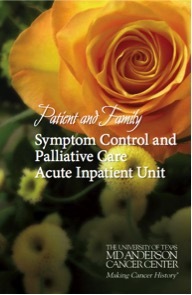 3) Unlimited access/downloads of palliative care tools and resources, such as Palliative Care Reference Cards from the Institute of Palliative Medicine. 4) Eligibility for a travel grant to learn or teach. The IAHPC awards several Traveling Scholarships each year, enabling successful applicants to attend international conferences that increase practical knowledge as well as foster important peer relationships. Applications are now being accepted for 10 Traveling Scholarships to attend the European Association for Palliative Care congress being held in Berlin, Germany, 23-25 May 2019. The Traveling Fellowships Program has provided financial assistance to many palliative care professionals who accepted invitations to teach in countries such as Africa, Asia, Asia Pacific, Eastern Europe, Latin America, and the Middle East. It is an ongoing program; applicants are asked to apply at least three months before they expect to travel. Membership is free for undergraduates and medical students, as is membership for post-graduate students in palliative care programs. Sign up now!